Stroll into the courtyard of London's Somerset House over the next few weeks and you'll come face-to-face with Chinese artist Ai Weiwei's Circle of Animals. The giant bronze heads, which represent the signs of the Chinese zodiac - rabbit, goat, rat, tiger and so on - are arranged in a semi-circle on six- foot poles.The symmetry is pleasing, and there's ample space to walk around each head in deep contemplation (if you want to). It is a shame, then, that the same cannot be said for the exhibition currently on display inside the venue. Held in London for the first time this year, the Sony World Photography Awards features the winners and runners-up in categories as varied as documentary, sport, portraiture, landscape and fashion, showcasing the theme 'From Chaos into Order'. And nowhere is chaos more obvious than in the exhibition's confused and cluttered curation. The sheer volume of work requires a vast exhibition space, split over three levels and six rooms. With no clear route through the exhibits, the visitor's focus is distracted from the photographs and the experience becomes disorienting and, frankly, downright irritating. Those unfamiliar with the photographers are given little context. Few of the pictures are labelled adequately, with many lacking basic details such as where and when they were taken. Instead, tablet computers (Sony, of course) display a selection of images by the same photographer and a brief narrative. On the day of my visit, some of these did not appear to be working, and those that were had crowds of people jostling to read their tiny screens. In another misjudgement, some of the exhibition's most high-profile images - those which had been used on promotional materials - are displayed on television screens (Sony, again). Here, a disproportionate amount of time is given to the photographer's name, while the pictures themselves appear all too briefly. Also lacking is a sense of cohesion within the exhibits displayed in each individual room: jaunty photos of moustache-shaped pubic hair sit alongside images of victims of sexual assault. The effect is not simply jarring (as no doubt the curator intended) but it simply doesn't work as a concept. Rather than being though-provoking, the impact of the more serious set of pictures is lost. It's just all a bit contrived and detracts from the outstanding photographs. 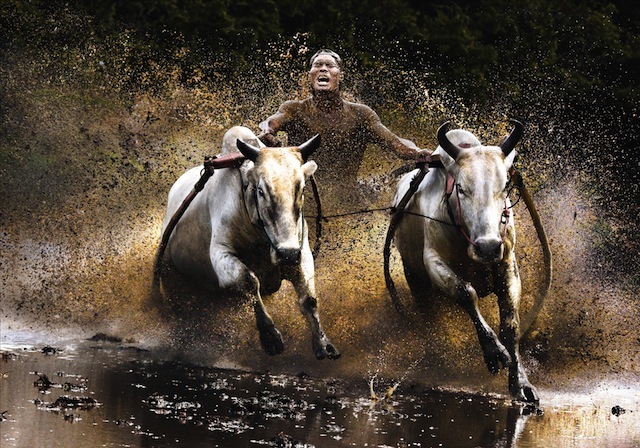 The winner of the Open Photographer of the Year Award, Chan Kwok Hung's picture 'Buffalo Race' is perhaps the standout image. Taken in Western Sumatra, it depicts an annual event where local farmers race their livestock, biting their tails to make them run faster. There are other photos just as stunning, and the sad thing is that youn could easily leave the exhibition without realising who the winners of these awards are, nor have a sense of the hard work and dedication that capturing their photographs entailed. It's a muddled display. And some of the blame must lie with the heavy sponsorship by Sony. Their name was an intrusive presence - on the tablet computers, TV screens and in an entire room dedicated to advertising the use of Sony cameras. Corporate benefactors are undoubtedly becoming more common in the arts and this is not necessarily a bad thing. But the balance between the needs of the sponsor and the creative requirements of the exhibition needs to be finely tuned. And sadly, here, this has failed. The Sony World Photography Awards 2011 are at Somerset House until 22 May.